Plants need water, carbon dioxide and light energy from the sun to make their own food through a process called photosynthesis, so they can grow, reproduce and survive. Water lilies have access to plenty of water since their stems are at the very bottom of the pond, with their leaves floating on the water's surface, but they have evolved other adaptations for survival. Water lilies live in water because they evolved adaptations, special characteristics or traits, to allow them to survive in that environment, such as weak stems, flat, broad leaves with stomata on their upper surface and bowl-shaped flowers. Adaptations are special features that allow a plant or animal to live in a particular habitat, but make it difficult for them to live somewhere different. This is why certain plants live in one area but not in another. For example, water lilies thrive in water but would wither and die on land. 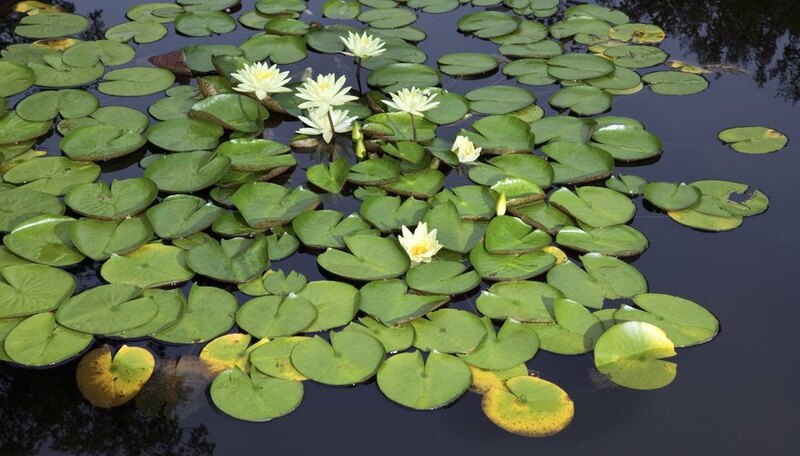 Aquatic plants like water lilies have one big advantage: They have plenty of water all around them. This means water lilies don't need adaptations for absorbing, moving or saving water. They save energy because they don't need to grow elaborate root structures or vascular tissues. They don't need this additional support because the buoyant water keeps them afloat. Water lilies don't need adaptations like strong woody stems and deep anchoring roots. Instead of using energy to keep their stems strong, they focus on maintaining strong leaves. All plants need stomata on the surfaces of their leaves for photosynthesis. These tiny pore-like holes take in carbon dioxide and expel oxygen. The stomata of water lilies are on the upper surface of their leaves, maximizing air exposure. Stomata on the underside of the leaves would be wasteful because water contact interferes with the exchange of carbon dioxide and oxygen. However, a watery habitat does present some challenges to water lilies. Pollination via wind or animals isn't possible underwater, so water lilies have evolved adaptations to keep their flowers above the water's surface. Water lilies have bowl-shaped flowers and broad, flat, floating leaves to let them gather the maximum amount of sunlight, which does not permeate the water's surface very deeply. Plus, their leaves and stems contain wide air spaces that run all the way down to the roots, which provide more buoyancy via a reservoir of carbon dioxide and oxygen. Gillespie, Claire. "Water Lily Adaptations." Sciencing, https://sciencing.com/water-lily-adaptations-8749756.html. 10 April 2018.